Chai Coconut Brown Rice Pudding made with no refined sugars and cooked brown rice is so easy, delicious and wholesome, you can have dessert for breakfast! I can’t help but feel a slight twinge of regret now that the summer solstice has passed. Knowing that the days will gradually get shorter and shorter makes summer feel over before it even began, and it doesn’t help that my daughter reminded me this morning that we’re 26 weekends away from Christmas. And I felt a bit panicked. But let’s not be glum, summer really is here for a while; since Mondays tend to feel a little dramatic, something warm and cozy to start the week is in order. Despite our over-100 degree weather weekend, I woke up to a chilly California morning, the kind when you almost doubt that the sun will really deliver, and all you crave is something warm until the morning fog dissipates. Pudding for breakfast sounds like a very good idea, don’t you think? Ever since I shot my recipe video for overnight refrigerator oats, my daughter has joined me in the overnight oats obsession. She has eaten it every single morning for 55 days straight, never wavering. I tend to change things up each morning — but not by much. 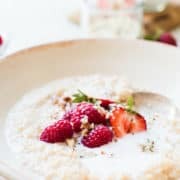 When I’m not eating overnight oats, I keep things simple with hot oatmeal, rather bare and bland by comparison. But once in a while, I like to treat myself, and when I made this brown rice pudding, I really had breakfast in mind. 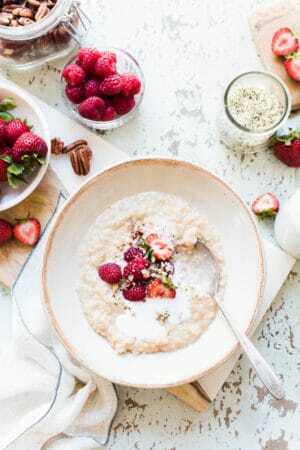 In many ways, it was a like a healthy form of champorado, which is a chocolate rice pudding in the Philippines, commonly eaten for breakfast, and something I’ve already riffed on when I shared my chocolate coconut oat porridge with you. After tasting this chai coconut brown rice pudding, I realized that I couldn’t pidgeon-hole it as a breakfast, or a dessert, for that matter. The truth is, it’s wholesome enough to enjoy for breakfast and decadent enough to savor as a cozy dessert. Warm coconut milk is mildly spiced with chai tea, sweetened with maple syrup, and the base for a very creamy brown rice pudding — it doesn’t take long when you use leftover brown rice! You can eat it warm, or chilled, too. 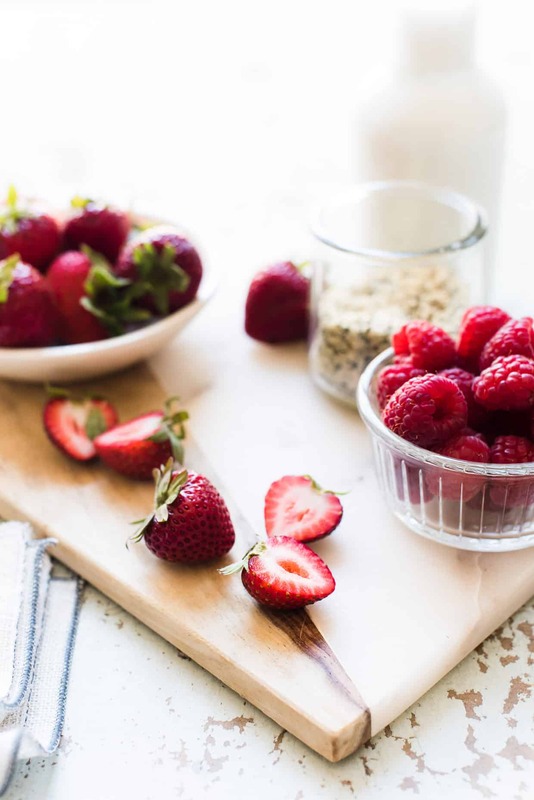 Top it with fresh berries, nuts, and seeds, to add more nutrients. It’s all up to you! 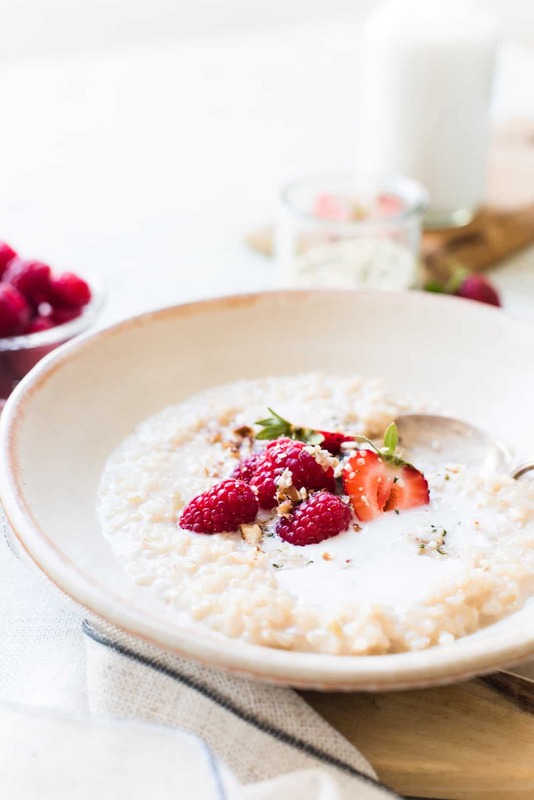 This recipe for Chai Coconut Brown Rice Pudding is made with no refined sugars and so delicious, you can have dessert for breakfast! Using cooked brown rice make it extra easy, and the spices from the chai tea make it especially cozy. Combine the coconut milk, water, maple syrup, bag of chai tea and salt in a small saucepan. Set over medium heat and bring to a gentle boil. Add the brown rice and lower the heat to a simmer. Cook, uncovered, for about 10-15 minutes, or until the rice has reached your desired consistency. The rice should be fluffy and creamy. Serve with a drizzle of more coconut milk, fresh berries, hemp seed, nuts or your favorite toppings. Wow this looks yum, perfect for breakfast! Thank you for giving a different kind of breakfast inspiration! 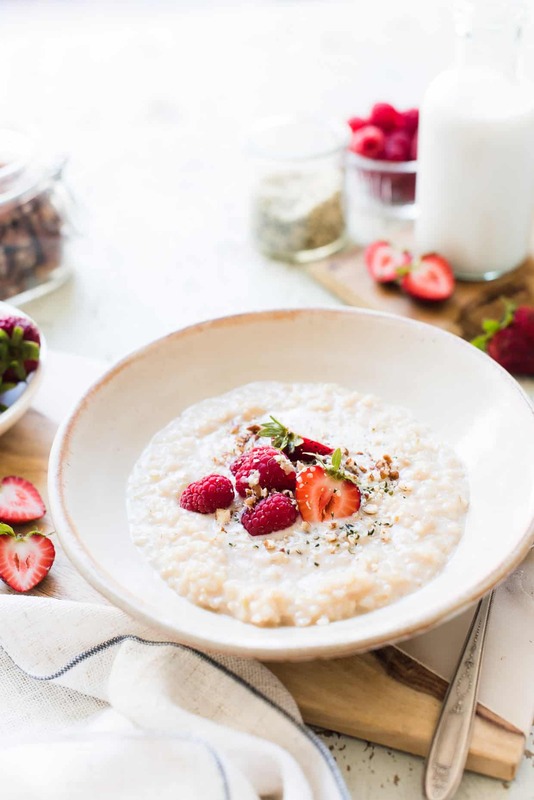 I’ve never thought of rice pudding as breakfast food but this looks so tasty (and pretty)! I am really excited to try this recipe this summer.